Best Toner Cartridges for HP LaserJet Printers | No .. is HOT! 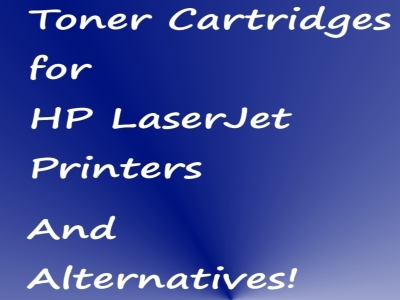 There's choice when looking for a toner cartridge for your HP laserjet printer. I try to help you by researching the options, so you can choose the right toner cartridge for you. It may give you an idea about differences between certain toner cartridges. We're talking here about original toner cartridges, compatible toner cartridges and remanufactured toner cartridges. For "Original" you may also read "Genuine" and "OEM", the latter means Original Equipment Manufacturer. "Compatible" means new toner cartridges with the same specifications as original cartridges, but made by other manufacturers (third parties). "Remanufactured" means original toner cartridges that have been through one cycle of service before undergoing a professional remanufacturing process. When it's about time to replace a toner cartridge, in general, it is recommended to not expose a toner cartridge more than a few minutes to light. So leave the cartridge in the packaging until you actually install. Don't touch the imaging drum on the bottom of the cartridge, as it may cause print-quality problems. Rock the cartridge a bit from front to back to distribute the toner evenly inside the cartridge. Less toner on one side may cause that only a vertical half of a page is printed. The toner cartridges you'll find below - price indications are in US-Dollars -, become more and more popular. Original HP Toner with JetIntelligence, enabling you to print more pages per cartridge, HP states. - Pro M252n, Pro M277n. 277 cartridges are also referred to as HP M277 toner cartridges. See Amazon here for the HP 201x Black Toner Cartridge - CF400x. A good alternative for this HP 201 toner, that costs less, is a compatible toner cartridge with same page yield, guaranteed quality, cost per page: about 2 cents, shelf life: 24-36 months. These compatible cartridges are new and don't void your printer's warranty. This new, original, black color toner cartridge HP 14x - CF214x - yields about 17,500 pages. See Amazon here for the HP 14x Toner - Black - CF214x. A good alternative that costs less, is a remanufactured toner cartridge with same page yield, guaranteed quality, cost per page: less than 1 cent, shelf life: 24-36 months. These compatible cartridges don't void your printer's warranty. See 4inkjets here for the remanufactured Black toner cartridge. Original HP Toner with JetIntelligence, enabling you to print more pages per cartridge, HP says. See Amazon here for the original HP 201A Cartridge CF400A Toner - Black. This new, original, black color toner cartridge HP 26A - product number CF226A - yields about 3,100 pages. See Amazon here for the HP 26A Black Original LaserJet Toner Cartridge CF226A. A good alternative that costs less, is a compatible toner cartridge with same page yield, guaranteed quality, cost per page: about 2.5 cents, shelf life: 24-36 months. These compatible cartridges are new and don't void your printer's warranty. See 4inkjets here for the compatible HP 26A Black Tober Cartridge. Cartridge yield: about 2,200 pages. See Amazon here for the original HP 83X (CF283X) Black Toner Cartridge. A good alternative that costs less, is a compatible toner cartridge with same page yield, guaranteed quality, cost per page: about 1 cent, shelf life: 24-36 months. These compatible cartridges are new and don't void your printer's warranty. See 4inkjets here for the compatible HP 83X Black Toner Cartridge. This new, original, black color toner cartridge HP 130A - product number CF350A - yields about 1,300 pages. See Amazon here for the HP 130A Black Original LaserJet Toner Cartridge CF350A. A good alternative that costs less, is a remanufactured toner cartridge with same page yield, guaranteed quality, cost per page: about 5.2 cents, shelf life: 24-36 months. These remanufactured cartridges don't void your printer's warranty. See 4inkjets for the HP 130A Black Original LaserJet Toner Cartridge. Cartridge yield: about 1,800 pages. See Amazon here for the original HP 131A Yellow Original Toner Cartridge CF212A. A good alternative that costs less, is a remanufactured toner cartridge with same page yield, guaranteed quality, cost per page: about 2 cents, shelf life: 24-36 months. These remanufactured cartridges don't void your printer's warranty. See 4inkjets for the remanufactured HP 131A Yellow toner cartridge. This new, original, black color toner cartridge HP 90A - product number CE390A - yields about 10,000 pages. See Amazon here for the HP 90A Black Original LaserJet Toner Cartridge CE390A. A good alternative that costs less, is a compatible toner cartridge with same page yield, guaranteed quality, cost per page: less than 1 cent, shelf life: 24-36 months. These compatible cartridges are new and don't void your printer's warranty. See 4inkjets here for the compatible HP 90A Black Toner Cartridge. - 400 Color MFP M475dw. See Amazon here for the HP 305A Cyan, Magenta & Yellow Original LaserJet Toner Cartridges. A good alternative that costs less, are compatible toner cartridges with same page yield, guaranteed quality, cost per page: less than 3 cents, shelf life: 24-36 months. These remanufactured cartridges don't void your printer's warranty. See 4inkjets here for the compatible HP 305A Cyan, Magenta, Yellow And Black toner cartridges. See Amazon here for the HP 05A Black Original LaserJet Toner Cartridges. A good alternative that costs less, are compatible toner cartridges with same page yield, guaranteed quality, cost per page: less than 1 cent, shelf life: 24-36 months. These compatible cartridges are new and don't void your printer's warranty. See 4inkjets here for the compatible HP 05A Black Toner Cartridges. These new, original, black color toner cartridges HP 30A and HP 30X - product numbers CF230A and CF230X. The 30A yields about 1,600 pages and the 30X about 3,500 pages. So, with the 30X cartridge you can print more than twice the number of pages. See Amazon here for the HP 30A Black LaserJet Pro Toner Cartridge. See Amazon here for the HP 30X Black LaserJet Pro Toner Cartridge. Some toner on your cloth? In case you get some toner on your cloth, wipe it off by using a dry cloth and wash it in cold water. Hot water worsens it and sets toner into cloth.